KARACHI: Over 400 participants, including provincial ministers, government officials, international donors and members of the civil society gathered to celebrate the launch of Sindh’s first ever youth policy on Friday. The policy drew support from Oxfam, Bargad, the United Nations Population Fund (UNFPA) and Oxfam, Right Here Right Now (RHRN) and Civil Society Support Programme (CSSP) and a number of other civil society and youth organizations and government bodies spurred the process. Speaking at the event, Youth Minister Abid Hussain Bhayo said that the Government of Sindh is cognizant of the sheer number of young people in Sindh and is working towards fundamental changes that would transform their potential into a driver of growth for the province. He announced that under the Sindh Youth Policy, a Youth Development Commission and a Youth Venture Capital Fund will be established by the government. “Student Unions will be revived and remodeled to promote pro-peace, women friendly and student centered activities on campus. Five percent seats will also be reserved for youth in local bodies. Youth will be engaged in decision-making at the municipal and provincial levels while community service and volunteerism will be promoted. Through youth led campaigns, inter-faith harmony will be encouraged,” he said. Youth Affairs Department Secretary Dr Niaz Ali Abbasi announced the establishment of the Sindh Chief Minister’s e-Rozgar scheme, which will provide job opportunities to youth without formal education. “Efforts will be made to encourage youth entrepreneurship through training at incubation centers, market linkages and partnership with educational institutions,” he said. Fifty-two per cent of Sindh is urban; a sizeable number of which are young. They have very different needs compared to other demographics. Sindh’s youth rightfully demand opportunities for their education, health, personal development, recreation and a prosperous future. The highlights of the youth policy include the establishment of a youth development commission; a district structure for the youth affairs department; a centralized information system on youth development; a job data base and the establishment of a youth venture capital fund. The Sindh Youth Policy aims at building youth who are economically sound, socially progressive and politically engaged, who possess appropriate skills and tolerant values of good citizens. The policy is central to systematically integrate, implement and evaluate all youth development work in the province. 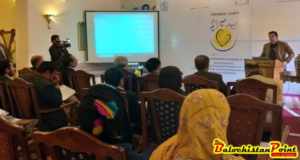 Bargad Executive Director Sabiha Shaheen congratulated Sindhi youth for being given a comprehensive framework aimed at their social, economic and political empowerment. “From 2012 to 2015, over 5000 young people participated in the consultative process. The policy, devised in light of suggestions and needs of Sindh’s youth, includes a clear roadmap, time-bound strategies, quantified targets and potential partners,” she said.